Appeal to Singapore’s Land Transport Authority to re-route the proposed cross-island MRT line away from the MacRitchie forest – sign the petition HERE. “The Central Nature Reserve protects our precious remaining rainforest. However, the forest is actually broken into many fragments, large and small. These fragments are separated by a number of man-made areas such as expressways, roads, golf courses, reservoirs, military installations, firing ranges, water-tanks, etc. 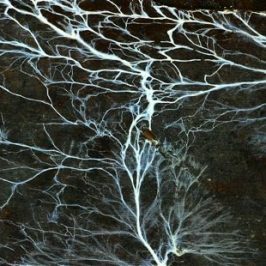 Any separation, no matter how wide or narrow, may isolate populations of certain animals into small genetic pools that can lead to the eventual demise of species. “Birds, in spite of their ability to fly, are no different. 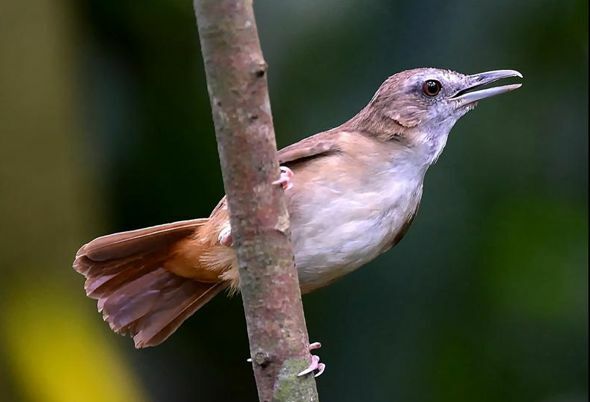 This is especially true for habitat specific species, especially those that stay in the lower storey of the forest; like our forest babblers (below: Abbott’s babbler). It is very important then that we afford full protection to our larger remaining forest fragments, especially those that still support areas of original rainforest. The northern MacRitchie forest is one such fragment that has been recognised as a vital core for this part of the Central Catchment Nature Reserve. 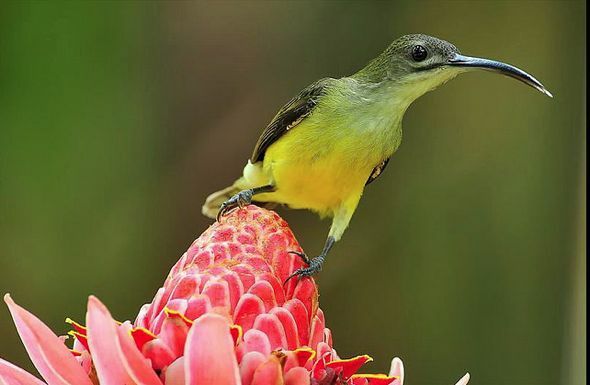 “The birdlife in MacRitchie has been regularly monitored for more than 3 decades by a wide range of local and foreign birders and bird photographers. 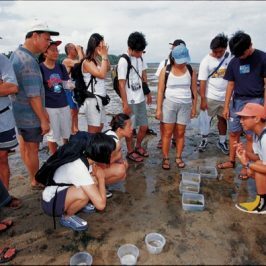 Scientific studies have also been carried out and I have personally conducted a few scientific surveys here since 1993. These studies will eventually be re-compiled for the BESG blog. “This long-term relationship with MacRitchie has allowed us to have a more intimate knowledge of the avian fauna. There are many resident and migrant species that have been recorded here over the years but what is most important are the forest residents. These birds are restricted in distribution due to the dependence on the rainforest habitat. 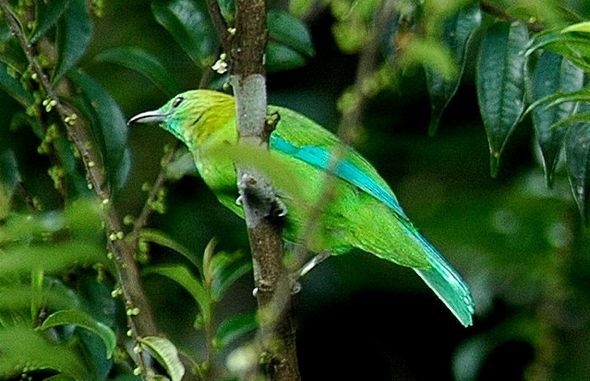 As we have such a small area of rainforest left in Singapore and this is constantly being chipped away, with no respect or reverence for the legally protected nature reserve status, many forest birds are now extinct and many more are declining. 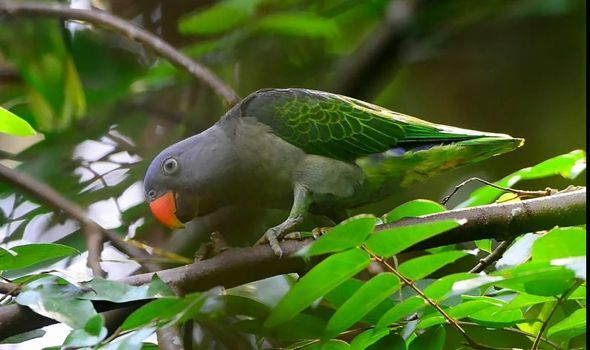 “MacRitchie has five internationally near-threatened resident birds. four are forest specialists: Grey-headed Fish-Eagle (Ichthyophaga ichthyaetus), Blue-rumped Parrot (Psittinus cyanurus) (top), Red-crowned Barbet (Megalaima rafflesii) and White-chested Babbler (Trichastoma rostratum). The first two are locally scarce while the barbet is uncommon. The babbler may already be extinct at MacRitchie. 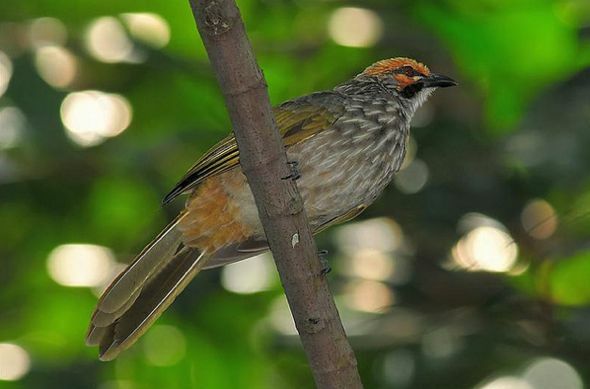 The fifth internationally near-threatened species is the more adaptable Straw-headed Bulbul (Pycnonotus zeylanicus) (above), which is only found at the fringe of the area. “There are 28 species of resident birds that are considered nationally threatened/near-threatened. Of these, the White-bellied Woodpecker (Dryocopus javensis) and the Moustached Babbler (Malacopteron magnirostre) may already be extinct and have not been recorded for several years now. 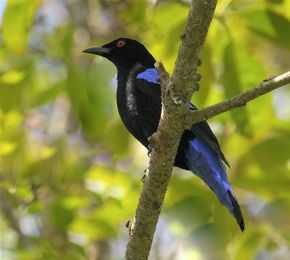 The Drongo Cuckoo (Surniculus lugubris), Malaysian Eared-nightjar (Eurostopodus temminckii), Greater Green Leafbird (Chloropsis sonnerati) and Lesser Green Leafbird (Chloropsis cyanopogon) are locally scarce forest specialists while the Thick-billed Green Pigeon (Treron curvirostra), Chestnut-bellied Malkoha (Rhopodytes sumatranus), Blue-eared Kingfisher (Alcedo meninting), Blue-winged Leafbird (Chloropsis cochinchinensis) (above), Red-eyed Bulbul (Pycnonotus brunneus), Chestnut-winged Babbler (Stachyris erythroptera) and White-rumped Shama (Copsychus malabaricus) are locally uncommon forest specialists. “The other residents of national concern are not confined to the rainforest habitat. 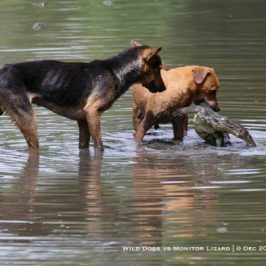 The Plaintive Cuckoo (Cacomantis merulinus) and Buffy Fish-owl (Ketupa ketupu) (above) are locally scarce while the Purple Heron (Ardea purpurea), Black-crowned Night-heron (Nycticorax nycticorax), Changeable Hawk-eagle (Nisaetus linmaeetus), Banded Bay Cuckoo (Cacomantis sonneratii), Rusty-breasted Cuckoo (Cacomantis sepulcralis), Violet Cuckoo (Chrysococcyx xanthorhynchus), Greater Coucal (Centropus sinensis), Spotted Wood-owl (Strix seloputo), Stork-billed Kingfisher (Pelargopsis capensis), Rufous Woodpecker (Micropternus brachyurus), Common Hill-myna (Gracula religiosa), Abbott’s Babbler (Malacocincla abbotti) and Oriental Magpie-robin (Copsychus saularis) are all locally uncommon. “Six other forest specialists are more common but still mainly confined and dependent on the CNR. 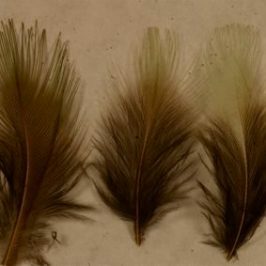 They are the Brown Boobok (Ninox scutulata), Cream-vented Bulbul (Pycnonotus simplex), Asian Fairy-bluebird (Irena puella) (below: male left, female right), Short-tailed Babbler (Malacocincla malaccensis), Little Spiderhunter (Arachnothera longirostra) (above) and Orange-bellied Flowerpecker (Dicaeum trigonostigma ). 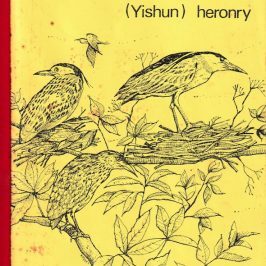 “There are a number of other forest specialists that have been recorded at MacRitchie over the years and some of these are either classified as remnant residents or escapees by others. This researcher considers them all as regular or accidental visitors. These include Crested Serpent Eagle (Spilornis cheela), Cinnamon-headed Green-pigeon (Treron fulvicollis) (Internationally Near-Threatened), Little Green-Pigeon (Treron olax), Black-headed Bulbul (Pycnonotus atriceps), Ashy Bulbul (Hemixos flavala), Black Magpie (Platysmurus leucopterus), Black-naped Monarch (Hypothymis azurea) (below), Thick-billed Spiderhunter (Arachnothera crassirostris) and Yellow-eared Spiderhunter (Arachnothera chrysogenys). “Other non-forest visitors also occur at MacRitchie. The strangest was an Internationally Vulnerable Christmas Island Frigatebird (Fregata andrewsi) that soared over the treetop walkway one day! 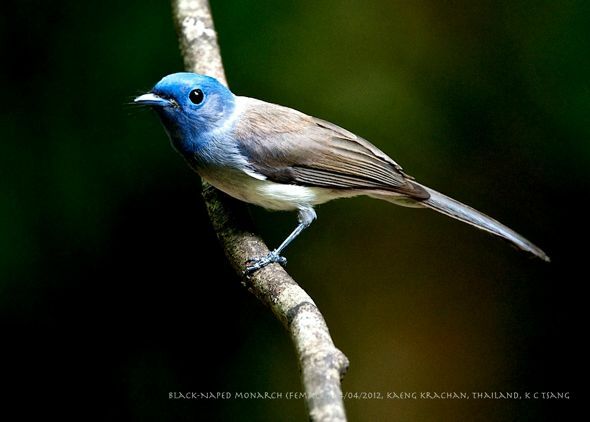 “Finally, MacRitchie also hosts a large number of migratory birds of many different species. 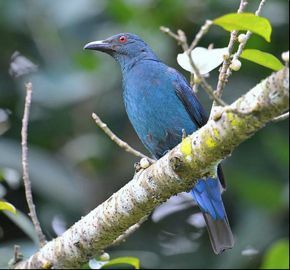 These too include species that are more forest-inclined such as the Internationally Vulnerable Brown-chested Jungle Flycatcher (Rhinomyias brunneata), the Slaty-legged Crake (Rallina eurizonoides), Oriental Scops-owl (Otus sunia), Black-backed Kingfisher (Ceyx erithaca), Siberian Blue Robin (Luscinia cyane), Ferruginous Flycatcher (Muscicapa ferruginea), Forest Wagtails (Dendronanthus indicus) and many more. 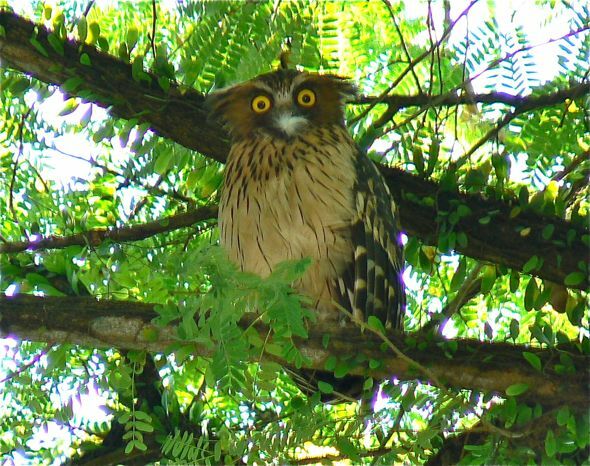 All images by Johnny Wee except Black-naped Monarch (KC Tsang) and Buffy Fish-owl (Subaraj Rajathurai). Bird Ecology Study Group Save MacRitchie Forest: 19. Would Singapore’s most beautiful damselfly species be extinct by the construction of Cross Island Line?